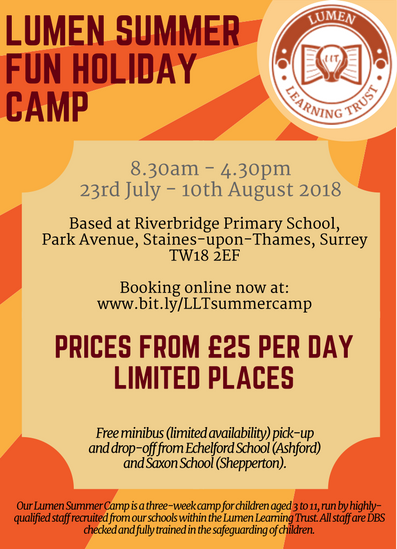 Following the incredible success of the 2017 Lumen Summer Camp, the 2018 summertime fun will begin on Monday 23rd July through to Friday 10th August. Staffed by teachers and teaching assistants drawn from our staff teams at Saxon, Echelford & Riverbridge parents can also be confident about the quality care their children will receive. A wide variety of activities will be on offer each day so there will be something for everyone to enjoy. Due to popular demand parents can book places for children aged 3 years again in 2018 and we will be running a separate programme for our youngest children. "My daughter has had a superb time. She's loved it all, especially the themes and the dressing up. We've loved the bus transfers too as it has made it really easy to drop off and pick up. Thanks so much and we hope that you do it again next year." "My kids absolutely loved it.. thanks to all the staff for making it so enjoyable." "My daughters were thrilled to return to camp each day, and came home each night full of stories about what they'd been up to. Next time we'll book our holidays around the club!" "Fantastic staff and very organised. Hope this camp continues next year...my boys will surely return." Click here to visit our Summer Camp pages to find out more.